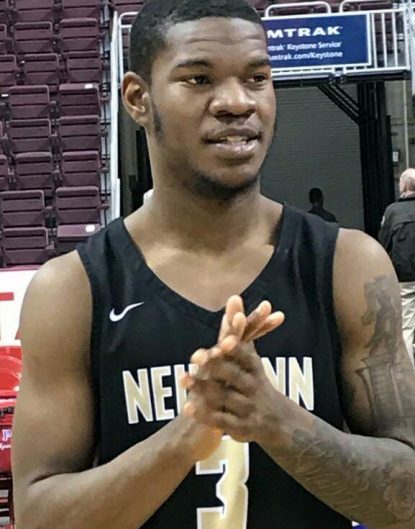 An electric performance by Dymir Montague led Neumann-Goretti to an impressive 57-42 victory over Richland in the PIAA Class 3A state championship March 28 at the Giant Center in Hershey, Pa. The Holy Family University-bound senior poured in 23 points, snared six rebounds, stole five passes, and blocked four shots. He shot 7 for 15 from the floor, 4 of 6 from three’s and 5 of 6 from the foul line while rest of the team struggled at 14 for 35, 2 of 15, and 4 of 9, respectively. Neumann-Goretti coach Carl Arrigale appreciated Montague’s contribution. The Saints (23-6) employed a methodical approach to their willing, but overmatched, opponents in the state tourney. After an 18-13 first quarter, the Saints pushed ahead by 31-21 at halftime and 45-29 after three quarters. Richland (25-5) mounted a comeback and crept to within 50-40 with 2:55 remaining in regulation. 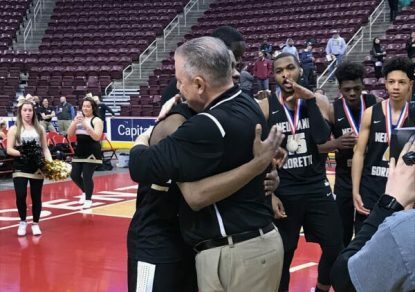 Dymir Montague carried the Saints with a hot hand, scoring a game-high 23 points, in the 57-42 PIAA Class 3A championship victory March 28 over Richland. Montague then nailed five of six free throws down the stretch and finished as the Saints’ lone double-figure scorer, a surprising statistic since four different Saints had scored five or more points. The 6-foot, 3-inch wing guard scored 15 of N-G’s 27 second-half points. Neumann-Goretti outrebounded Richland by 57-42. Freshman TaQuan Woodley led with seven boards; Montague, junior Christian Ings (eight points, seven assists) and senior Marcus Littles (six points, four blocks) added six apiece. 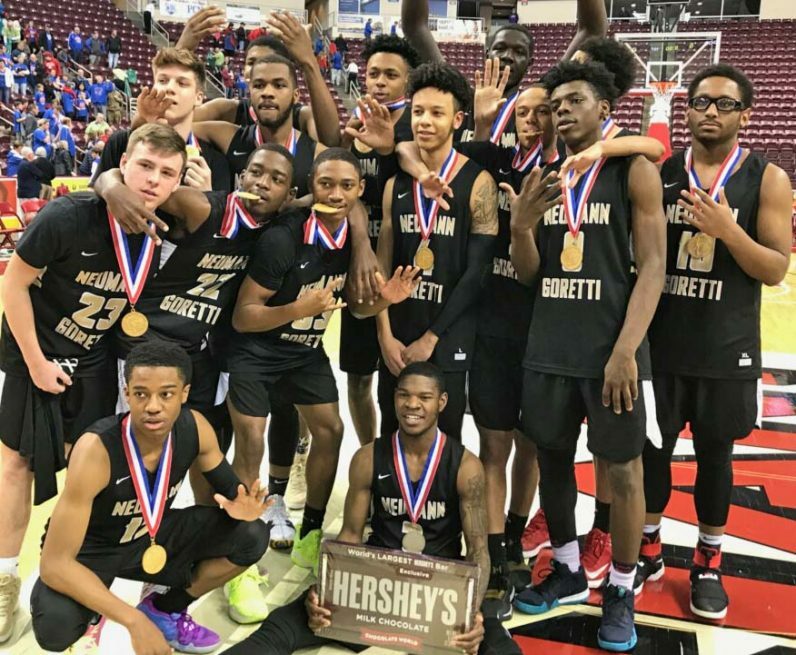 Neumann-Goretti has now captured five straight state titles — a record for any basketball program since the state tourney began in 1920. For Neumann-Goretti and the rest of the Catholic League, participating in the post-season began in 2009. The Saints have dominated, winning eight titles in the past nine years. The PIAA tournament had been scheduled to conclude on March 24, but bad weather necessitated re-scheduled practices and games. Coach Carl Arrigale right) shares a congratulatory hug with his star player, Dymir Montague, who is headed to Holy Family University in the fall. Overmatched opponents throughout the state might not understand what Warren is referring to. Neumann-Goretti’s basketball team losing in the PIAA tournament? Good luck with that. John Knebels can be reached at Jknebels@gmail.com or on Twitter@johnknebels.